Using a knife, halve cherries and remove the pits. In a small pot, mix cherry juice, bourbon, and starch. Add a portion of the vanilla sugar and cherries and heat over medium-high heat, stirring occasionally, until the cherry mixture has thickened. Transfer to the fridge and allow to cool until serving. Meanwhile melt sugar and a pinch of salt in a frying pan set over medium-high heat. Add butter and almonds and let caramelize, stirring often. Set aside and allow to cool. Transfer chocolate cookies to a resealable freezer bag and finely crumble. Whip heavy cream until stiff. In another bowl, mix mascarpone cheese, yogurt, remaining vanilla sugar, and confectioner’s sugar. Fold in heavy cream and add bourbon to taste. 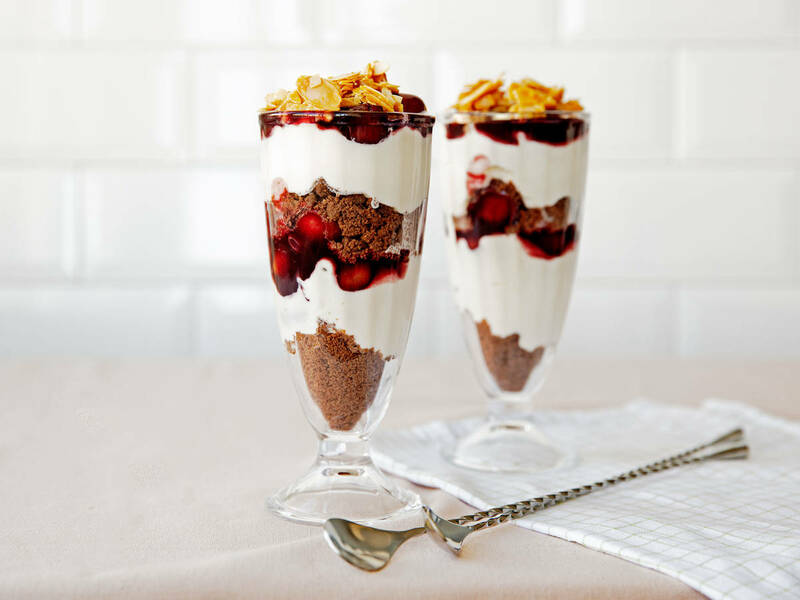 To serve, spoon layers of crumbled chocolate cookies, cream, and cherries to tall glasses. Continue with another set of layers and finish with the caramelized almonds. Enjoy!